Recently, I participated in a test drive of a new Infiniti Q50 Hybrid, from London to Brussels, via the Chunnel train. The object of the test, conducted along with crews driving three other Q50 hybrids, was to gauge what kind of fuel economy we might get on such a route. We were all supposed to meet up for dinner that evening in Belgium, to compare notes. 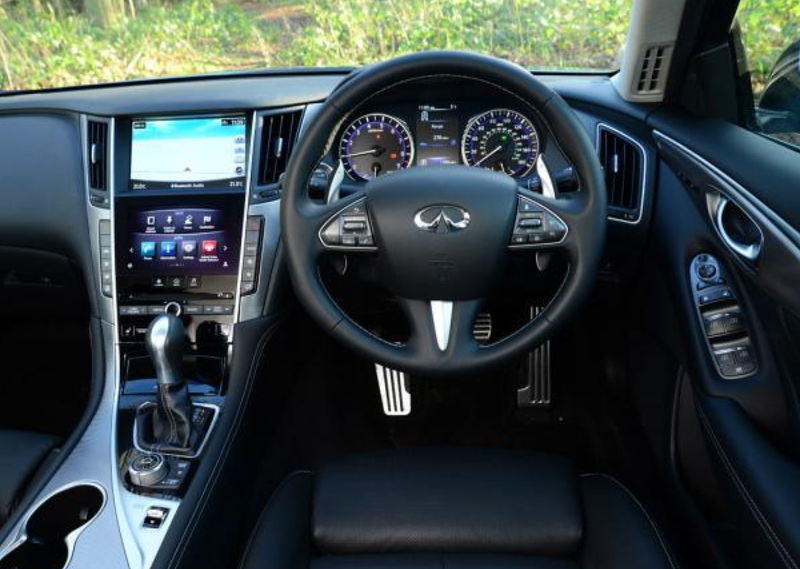 The Q50s were all nicely equipped, with most every option, including the latest satellite navigation system, with “real-time” traffic bulletins. 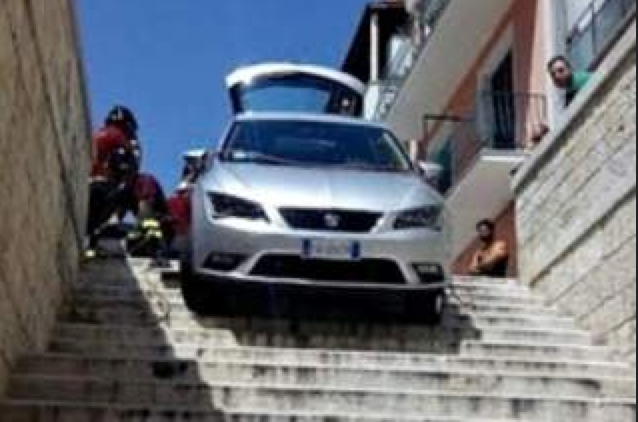 The driver actually drove down the steps, with predictable consequences, except for the added bonus of having the story go viral worldwide on social media. The photos he posted were rather amusing. “I hope we have better luck with this system, since I have had similar experiences with sav-navs – being directed through orchards, down bicycle paths, across railroad yards, over cliffs, etc.” I said. Our luck would not, in fact, be better. Soon after our caravan of four vehicles left the starting point, the sav-nav systems, which had been programmed with the same destination information in each car, directed two of the vehicles around the motorways west of London. The other two inexplicably directed their cars to the east. Despite having “real-time” travel info, the sat-nav did not warn any of the four vehicles of the constipated traffic ahead on each route. After sitting in a seemingly endless traffic tie-up for nearly an hour, I decided – since it was my turn to drive – to pioneer a new route through central London. At rush hour. 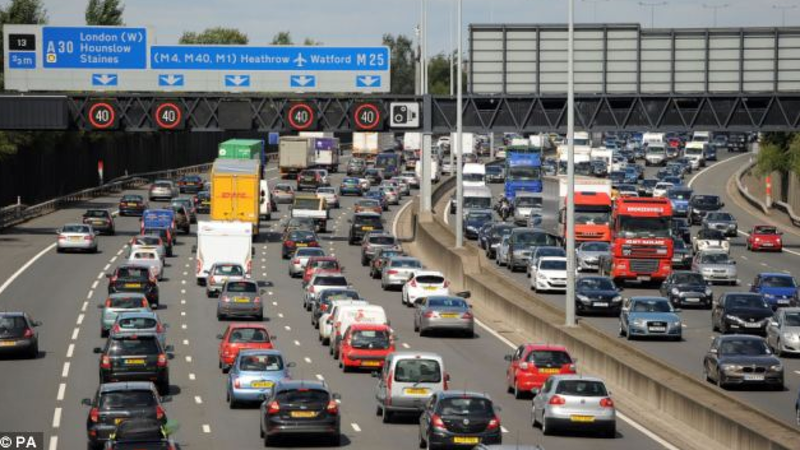 My admittedly foolhardy improvisation was meant to keep us moving – anything was better than sitting – and to avoid the inevitable stoppages around Heathrow to the west, and the nightmare of the Dartford toll crossing to the east. After some ignoring of the incessant “Please make a u-turn” warnings, the sat-nav eventually did re-calculate the route through London. Except for a couple of belated “Turn left NOW” warnings that we couldn’t heed quickly enough, we made reasonably good time, all things considered. We wondered whether our mates were having an easier time of it on their respective routes. We tried to hurry along as best we could to the Chunnel train, mindful of the speed cameras every – oh – ten feet or so. Arriving at the loading dock for the train, we were directed away from a train that was leaving immediately – despite our pricy “Easy Pass Plus” window tag – and herded onto one that wouldn’t leave for another 25 minutes. “So much for our plan to make up a little time here,” I told Matt. He pointed out that, to this point, we had been on the road almost four hours – at least 90 minutes longer than the organizers of this trip had budgeted. “We will just have to make up as much time as possible on the other side,” Matt said. The odds looked to be in our favor, as Matt, from the Netherlands, would be driving roads with which he was entirely familiar. One handicap: Our Q50 was right hand drive – which was fine for me in the U.K. – but unnatural for him on European roads. But upon unloading after the crossing, and speeding onto the A16 motorway toward Brussels, we almost immediately got into another traffic jam. Once again, we received no warning of this from the “real time traffic” function. We did, however, receive numerous false alarms for problems on other roads that either had already cleared by the time we reached them, or for apparently non-existent issues. After sitting for quite a few minutes, I told Matt we should do as others were doing: leaving the queue and going backward on the autoroute to the last exit. Matt was a little reluctant, but finally joined in when the trickle of cars reversing turned into a torrent. We followed signs for Paris and Reims, with the voice of the sat-nav begging once more to make a u-turn. We didn’t really know where we were going, but at least we were making good time! By now, though, it was getting dark. After a while, we started seeing exits ahead for Brussels. We turned off, but weren’t long on that route when the navigation system started warning us of a major traffic alert ahead. It advised us to take a lengthy detour. “Let’s assume she is wrong again, and keep going,” I said. I guessed the warning was another out-of-date one, and that at this time of night, traffic problems would be greatly reduced. At least we fared better than these Italian tourists! Despite constant – annoyingly constant – warnings to turn back, take a detour, or be prepared to sit in a queue for hours, we breezed right through. There were construction zones, and earlier in the day these areas might have been congested, but at this time of night there was hardly any traffic at all. We made up a little time on this last stretch, but we were still hours late. The Q50 performed, aside from the sat-nav, flawlessly; but we completely lost track of our fuel economy. As we finally rolled in to the dinner stop we were informed, sadly, the restaurant had closed a few minutes earlier at 10:30 p.m.
“Where are the others?” I asked our greeter. This was stunning news. One team had phoned the restaurant earlier and reported they would not arrive before midnight. The two other teams had not been heard from at all. Matt and I were incredulous. We decided to celebrate at an adjacent bar, and wait for the others. No one else arrived for an hour. Then the rest straggled in. The last team arrived shortly after midnight. They told tales of being stuck near Heathrow for hours, or in the queue for the Dartford toll bridge kiosks for hours more. In France, they too became stuck on the A16 tie-up, but they waited it out. In Belgium they hit a violent rainstorm that we had missed. “How did you guys get here so early?” they asked. « Whatever Happened To Bart Maverick?